Hey folks, sorry I haven’t rapped at ya lately. I’m still working my way through 女のいない男たち, but it’s been slow going and has derailed my work on Hard-boiled Wonderland: I’ve only read two stories and the forward so far, and I skipped over “Drive My Car” (which I read in 文藝春秋 last fall), so I have 2.5 stories left. My attention span feels shot these days, thanks in part to work but also to the NBA playoffs (and now the Finals!). There were games every day for a while and then every other day, and now my Spurs are in the Finals again and the emotional toll is brutal: Controlling my emotional landscape is the game within the game. Another thing is that the stories have been less than spectacular so far. “Drive My Car” was okay, from what I remember, but I don’t feel any desire to reread it in Japanese just yet, maybe once the translation comes out. “Yesterday” will be in the June 9 fiction issue of the New Yorker and is already online for subscribers. It was okay. “Independent Organs” (it should definitely be “organ” and not “body” as I suggested in my post about the collection) was disappointing and a bit lame. So far “Scheherazade” has the most compelling start, and it partly has to do with the cool kanji compound 前世 (ぜんせい). Even beginner students should be able to draw out the meaning of this compound based on the basic rules for kanji compounds. This is, I believe, one of the Adjective + Noun varieties. 前 (before) + 世 (world) = the previous world = past life. So that’s a nice little passage, very typically Murakami, I’d say. But I think these stories have bored me a little because there is just so little action. One commonality that ties them all together so far is that, much like the stories in Dead Heat on a Merry-go-round, storytelling itself is a theme. But Murakami was more adept at shifting between narrating the person telling the story and narrating action directly in that 1985 collection. And I believe they were shorter than these stories (eight stories as opposed to six spread out over fewer pages?). I’m curious to know why he’s chosen to work with the current length. My gut instinct is that these are the first short stories he’s written in a long time and he feels the need to have his form take a “step,” which maybe he felt he took with novels by writing 1Q84 (his attempt at a “comprehensive novel”). At any rate, I have higher hopes for “Scheherazade,” and I’m curious to see what he does with the stories of shorter length toward the end of the collection. I’ll try to check back in before too long. – It has a great cover. The art style is simple and almost like calligraphy in effect. I especially like the inclusion of a cat, which seems typically Murakami. The bar is also a nice touch, too, but the messy lawn under the tree gives the image its true power: it feels real and messy, very natural. Murakami was impressively consistent with the length of stories, and I realize now (looking at the publishing history at the back of the book) that this is likely because all the stories were published in Bungeishunju. I’m kind of glad I didn’t know this earlier (and therefore didn’t blow cash on individual issues other than the very first one). 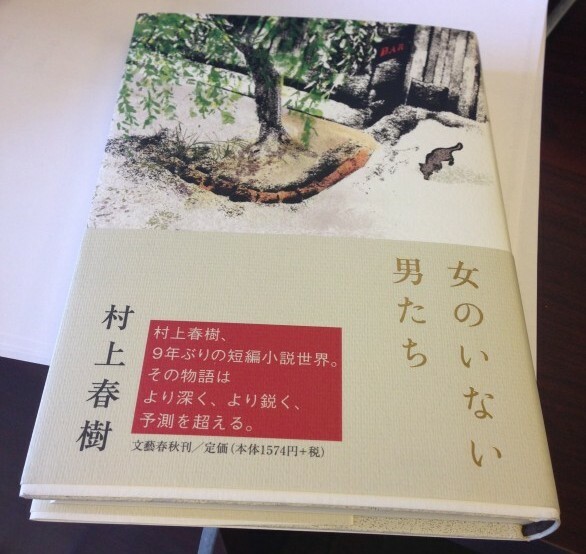 Only the final story is a brand new 書き下ろし (kakioroshi). – Notes on story titles: A couple of Beatles songs in there. One 1001 Arabian Nights reference. One nod to Hemingway. A Japanese pun (独立器官 = independent organs instead of 独立機関 = independent bodies？). And a Japanese surname (木野 = Kino). – He includes a forward, which he immediately notes that he does not enjoy doing but had to for this collection due to the way it came about (ooh, very interesting…I’ll save the rest of the read for my commute tomorrow). – Looks like a fun read! I’m sad to say that we’re well beyond Murakami’s early collections which were looser, more abstract, and contained shorter stories. I’ll probably start reading this week and may or may not liveblog at some point this weekend. I make no promises: It is the NBA postseason.